A well preserved four bedroom town house located in the center of Cernache do Bonjardim. The house, which is set on two floors and has an ample attic, is connected to both mains water and electricity and is in habitable condition although it would benefit from modernization works. 115 square meters and is set over two floors plus attice with standing height. There is plot of land measuring 728 square meters to the house. The main entrance to the house is via a covered terrace leading into an entrance hall. There are three good sized rooms and a rustic kitchen with large pantry. There is a door leading to the rear of the property. There is also a simple bathroom with toilet, bidet and hand wash basin on the ground floor. A wooden staircase leads onto the second floor. Here we have three large rooms and a good sized partially tiled bathroom with toilet, bidet, pedestal sink and bathtub. The wooden staircase goes on to the attic of the house, which could be converted into more living space. The roof structure of the house is in good order of repair. The floors in the rooms of the house are well preserved wood, the windows are single glazed aluminum with traditional interior wooden shutters . One of the rooms upstairs has a glass window front with views to the road. To the rear of the house there is a plot of land measuring 728 square meters, with many mature olive trees and a variety of mature fruit trees like peaches, apples and pears. There is also a large well for irrigation purposes. An ideal plot for a large vegetable garden and, although in the center of town, with much privacy. 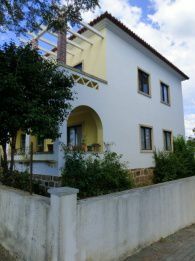 The house is located on the main road and opposite the fire brigade in the peaceful town of Cernache do Bonjardim, which has cafés, bars, many shops, mini-markets, pharmacy and schools. The larger town of Sertã is ten km away. Sertã has several supermarkets, many shops, restaurants, banks,an indoor and an outdoor pool, a public library, schools, health centers, cafés restaurants and bars, parks and municipal buildings and is easy to access off the IC8 dual carriageway. The closest airport to the property is situated at Lisbon, which is around two hours and ten minutes. Lisbon airport is serviced by a variety of low cost airlines, which operate regular flights to and from the United Kingdom and other European countries.